“To be a living witness for life takes confidence. 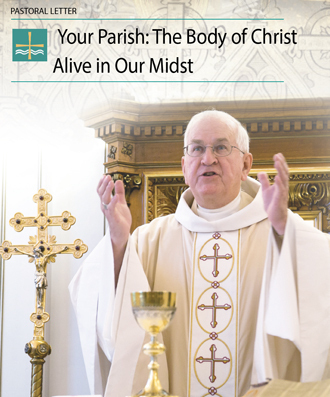 Not confidence that comes from ourselves but confidence that is a gift from God,” the archbishop said. Hundreds gathered at St. Martin of Tours Church, 636 S. Shelby Street, Jan. 20 for the annual Mass, which is sponsored by the Knights of Columbus and the Ancient Order of the Hibernians. It is celebrated each year near the anniversary of the landmark Supreme Court decision Roe v. Wade that legalized abortion in 1973. Isaiah used the image of the intimacy of a married couple to show God’s love for us, he said. “People who have been loved and consider themselves the delight of another, they are free. They are free to think of another,” he said noting that is integral to message of the pro-life memorial Mass. “There are people who trust you and who look to you for advice and help and only through your voice and your hands can you touch their hearts,” he said. There are people, he said, who feel forsaken, who feel as though they are backed into a corner and they don’t know where to turn. “Let them turn to you. Let your self be a witness that the church and our world desires,” he said. Baskets of red roses and 46 single white roses were brought forth during the offertory procession. The white roses represented the years since the Roe v. Wade decision and the red roses represented the gift of life. Representatives from parishes and organizations received a red rose following Communion as a sign of recommitment to pro-life ministry. To everything there is a season, and a time to every purpose under heaven. Ecclesiastes 3:1 I have decided to give you fair warning….